Bugs. Arachnids. Call them what you will, they are the greatest and most terrifying threat mankind has ever faced. A species so utterly ruthless and alien that they are beyond comprehension. The Arachnid Army Book takes this most compelling threat and reveals a level of detail never before seen in print. With a sub-species for every conceivable military or evolutionary requirement, the Arachnids represent the pinnacle of creation, an unstoppable force that rampages throughout the galaxy. Whether gathered as a few light swarms or massed within a great colony, the Arachnids are the most dangerous army fought by the Mobile Infantry. The Arachnids are the greatest threat the Citizens' Federation has ever faced, pitching humanity into a Battle of the Species. 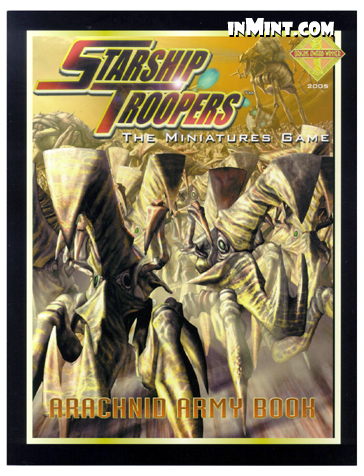 Arachnid Army Book is a sourcebook for Starship Troopers: The Miniatures Game and you must possess a copy of Starship Troopers: The Miniatures Game to use the contents. For two or more players. Ages 12 to adult.